Welcome to Patch 3.27! The new Exalted Chest has made its grand appearance into Mallhalla with three new exclusive Skins. Also, this is the first time Zariel will debut on the Legend Rotation and have his price reduced to 5400 Gold! Additionally, we’ve changed this week’s BotW to “Betrayal!”, a chaotic three player FFA. We also have done balance changes, bug fixes, and controller improvements! The Exalted Chest has made its appearance! The Exalted Chest is in the store for a limited-time with three exclusive skins: Silvermane Gnash, Lionguard Diana, and Komainu Jiro. Zariel is now priced at 5400g! This week’s BotW is “Betrayal!”. Queue up against 2 other Players in a 3-minute FFA game. Score 2 points for KOing an enemy, lose 1 point for being KO’d. Can you survive the ever shifting alliances and score the most points at the end to win? Most points at the end wins! When a controller is disconnected while in a lobby, players will no longer receive an error dialog that must be clicked through. The game will now pop up the same temporary message that appears when a controller disconnects in the middle of a game. Fixed a visual glitch that caused some facial expressions’ mouths to be off-centered. Fixed a bug in online lobbies where when a player has multiple guests and one of the lower-numbered ones leaves, the other guests’ names wouldn’t update to reflect their new number until after the game started. It will now make that update instantly. Fixed an extremely rare bug where, in times of unusually high server traffic, the Login Bonus screen could appear during an online game. This week Zariel, The Celestial, makes his first debut on the Rotation list! 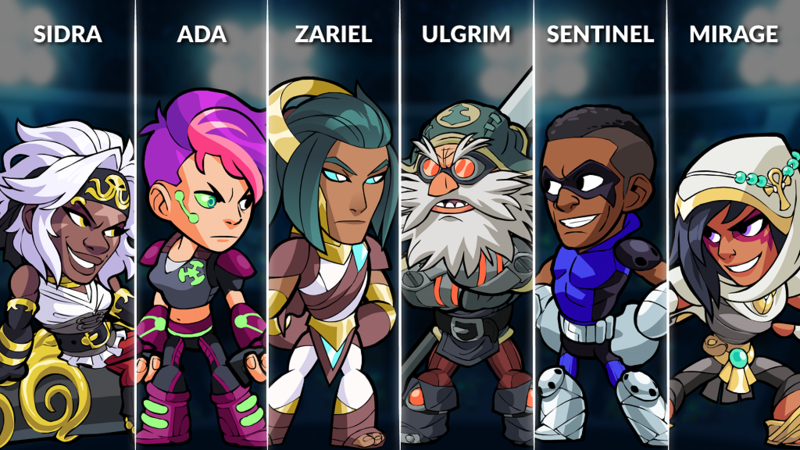 This weeks rotation also includes: Sentinel, Ada, Mirage, Sidra, and Ulgrim. Zariel – Making his first appearance on the Legend Rotation list, The Celestial, a warrior deity of Holy Justice, who abides in blessed Elysium. Zariel uses Gauntlets and Bow to take down both Demon hordes and any warrior participating in the Grand Tournament. Sentinel – The Hammer of Justice has been brought to Valhalla to protect those in need with his Katars and Hammer! Ada – Armed with Blasters and Spear, this nano-tech, elite combat hacker aims to win in the Grand Tournament. Mirage – An occultist, martial artist, and spy, this agent uses the powers of magic and time-travel along with her Scythe and Spear to take down her foes. Sidra – The Corsair Queen, known for her legendary and fearless raids, is prepared to fight with her Sword and Cannon! Ulgrim – The legendary blacksmith forges his way into battle with Rocket Lance and Axe! This week’s round of balance adjustments is focused on bringing the rate of damage on several weapons and Legends in line with their coverage and speed, while increasing the fluidity and useability of underperforming kits for more responsive attacks and movement. We have also made adjustments to allow escapes from a few solo and team combo attacks that could deal a great amount of damage too quickly, such as the Lance and Zariel’s Neutral Bow Signature. In a continued series of adjustments focused on separating the rate of damage done between armed and unarmed players, we have decreased the damage on this kit’s faster and most used attacks. This creates a greater advantage for players fighting with weapons, ensuring not only greater range on most attacks, but also by building damage faster when scoring hits. Unarmed Neutral Light: Decreased Damage from 16 to 14. Unarmed Neutral Air: Decreased Damage from 15 to 14. The Axe kit finds a couple of changes, notably on it’s upward-directed attacks. We have slightly reduced the reward on hit for the Neutral Air in order to turn the previous combo ending in a Gravity Canceled Down Light into a string, but have also lowered the force of the Neutral Air to keep the target in range for follow-up attempts at a wider range of health values. Meanwhile, the Down Light has received a boost in utility with less recover time. This helps Axe players use this attack more readily, as it was too easily punished and generally stiff in its role against airborne opponents. Axe Down Light: Decreased Recover time on miss from 0 Fixed/12 Variable to 0 Fixed/9 Variable. Axe Neutral Air: Decreased Stun from 28 to 27; Decreased Force from 40 Fixed/20 Variable to 40 Fixed/18 Variable. While the utility offered by the Bow’s aerial kit is one of its key strengths, the force it offers above stage was too low to keep up with other weapons, lending itself to less flexible playstyles. We have increased the force on the Neutral Air to make the Bow’s aerial presence more threatening and secure knockouts at a more reasonable damage threshold. Meanwhile, the Bow’s Side Light has received a faster time to hit to enable player’s to better keep up with the current pace of gameplay, given that the Bow’s ground kit centers around slower attacks that demand a high degree of accuracy. Bow Neutral Air: Increased Force from 65 Fixed/30 Variable to 65 Fixed/33 Variable. Bow Side Light: Decreased Time to Hit from 12 to 11. The Hammer commands a great degree of aerial space with it’s powerful swings, but can also threaten a fairly wide area of on the ground with the distance its Side Light can move. We have shuffled some of the power within the Side Light to help players better combat a grounded Hammer user by reining in the maximum range of the Side Light, while increasing the stun for more reliable follow-ups when scoring a hit. Hammer Side Light: Increased Stun from a range of 23~15 to a range of 25~17; Slightly decreased bonus speed gained from a dash. We have some additional adjustments to the Katar Down Air following this weapon’s latest round of balance changes. The force has been slightly decreased on the ground hit, bringing the knockback closer to its previous distance for tighter follow-ups at a larger range of health values. We have also increased the stun for both the ground and the air version to aid in follow-up attacks after a Down Air. Katar Down Air: Decreased Force of the ground hit from 21 Fixed/10 Variable to 21 Fixed/7 Variable; Increased Stun of the ground version from 10 to 11; Increased Stun of the Air version from 12 to 13. The Lance Neutral Air has received a minor decrease in stun and a change to its range of force, as this attack allowed for an extended combo that set the Lance’s rate of damage too far above other weapons. This not only turns the previous three-hit combo involving Neutral Air into a dodgeable string, but also increases the consistency of follow-up attempts after striking with the back end of a Neutral Air. Lance Neutral Air: Changed Force from a range of 68~52 Fixed/0 Variable to a range of 68~40 Fixed/6~0 Variable; Slightly raised angle of knockback during the beginning of the flip; Decreased Stun from a range of 34~28 to a range of 32~28. The Sword is a solid and versatile weapon that can fit a number of different situations and playstyles, although its ability to build damage in a number of these situations was slightly higher than other weapons with less utility. We have brought the damage values on some of the Sword’s most useful attacks in line with other similar options and have also increased the cooldown of the Neutral Air, to allow player’s a greater window of opportunity to land when fighting against an aerial Sword user. Sword Neutral Light: Decreased Damage from 15 to 14. Sword Neutral Air: Decreased Damage from 18 to 17; Increased Cooldown on hit from 11 to 13. We have improved several Signatures that did not have enough range to be reasonably threatening in most match-ups, as well as a number of Signatures that carried to much risk for the coverage and reward they had to offer. Legends such as Artemis, Azoth, and Lin Fei will find faster movement on forward or upward leaping attacks, while Azoth and Lin Fei also now have a more fluid feel on several of their lengthier Signatures. Along with this pass for utility, we have also increased the damage on Caspian’s Gauntlet Signatures to be in line with other similar attacks from his peers. Zariel’s Neutral Bow has received increased Cooldown, and we have increased the effect of Same Move Directional Influence when struck by two or more instances of this attack during stun, in order to open escape routes from the 2v2 combo. Artemis Down Lance: Increased Speed bonus from movement, such as when dashing. Azoth Side Bow: Decreased Recover time from 12 to 7. Azoth Side Axe: Increased Speed bonus from movement, such as when dashing. Caspian Neutral Gauntlets: Increased base Damage from 22 to 24. Caspian Down Gauntlets: Increased base Damage from 20 to 22. Lin Fei Neutral Cannon: Decreased total Recover time from 19 to 16. Lin Fei Neutral Katar: Decreased total Recover time from 11 to 8. Lin Fei Side Katar: Decreased total Recover time from 18 to 13. Lin Fei Down Katar: Lin Fei now leaps off the ground 3 frames sooner; Decreased Minimum Charge time from 17 to 13. Zariel Neutral Bow: Increased Maximum Directional Influence angle allowed when struck by multiple instances of this power in a single combo; Increased Cooldown on hit from 11 to 33; Increased Cooldown on miss from 20 to 25. Blue Mammoth Games is an indie dev team led by friends who left bigger game studios to start their own. Since they began in 2009, Blue Mammoth Games has grown from two developers to dozens and are slowly unleashing their plan to take over the world, one "So Salty" taunt at a time. You can learn more about us at bluemammoth.com. © 2018 Blue Mammoth Games. All Rights Reserved.